I watched the video where the constellations are overlayed and stretched. In each case, is the anchor point the center of the face, or the center of a hand? Something that has a pattern of intention? I saw one that was simply the shape of the hand, which is a deviation from the mold. Thanks Interbane. The Last Supper aims to connect the deepest realities of human life. In terms of Christianity, the story says the deepest reality is that when a man, Jesus Christ, showed the world how to connect time with eternity, the response was betrayal and execution. The painting is set at the dramatic moment of betrayal, with Judas holding his bag of money and appearing surprised at the statement by Christ that one of the twelve will betray him. In astronomy, the deepest reality affecting human life, and especially from the limited visual perspective available in Leonardo’s day before the telescope, is the annual cycle of the seasons. The painting uses the very old and widespread Christian motif of saying that the story of Jesus Christ reflects the annual cycle of the seasons, seen in the path of the sun through the stars. Your question is then how Leonardo did this technically, using stars for body shapes. It is not a matter of using hands or face as anchor points. Rather, Leonardo first looked at the sky, drew the shape of the solar stars of each month using the precise natural accuracy for which he was rightly famous, and then embedded that natural observation in its sequential place in the painting. His objectives were to use this traditional matching of apostles and months (as seen at Chartres Cathedral, Amiens Cathedral, St Denis Cathedral, etc etc) as the lightly concealed structural framework upon which the dramatic story of betrayal could be built. So there is not a simple anchor rule. From right to left, the star path of the sun is seen as follows in the depiction of the twelve apostles of the Last Supper. Note that the video provides the star groups in reverse (from left to right starting with Pisces). The list below uses the star groups from right to left in correct order of time, beginning with Aries and going through the course of the year. And Jesus Christ as the central focus of the painting is modelled on the stars of the constellation Pisces, marking the position where the spring equinox precessed in 21 AD, with head, arms and hands. Leonardo also used this same stellar framework of the two fishes for his depiction of Christ in his painting of the Baptism of Christ. You have asked, Interbane, if the use of the hand of Doubting Thomas is an anomaly in the overall pattern. As the list above reflects, the stars of each constellation are unique in apparent shape, and each is very different and distinct. Only six of the twelve include the head of the figure in the depiction of the star group, while in the other six the stars are just used for hands and/or arms. Now, the fact is that the main star group of Virgo, the sixth constellation, is similar in shape to a pointing hand. None of the other constellations form this shape. For Leonardo, with his intense anatomical interests, this presents a basic opportunity to use the hand shape, and also to encode the basic message of the painting. The message is that the pointing finger invites the viewer to actually look up at the cosmos, to see the grandeur of the natural universe revealed in the visible shape of the stars of the night sky, and to reflect on how the story of Christ incarnates in human form the real and constant eternal pattern of nature formed by the path of the sun through the stars. Its also the finger that "the doubting Thomas" inspected Christ's wound with after his resurrection, which is consistent with what Thomas is primarily known for and adds to the narrative. But lets ignore this of course because the simplest explanation is not the best here! Good point, except that ignores the fact the finger is pointing to heaven and stuffs the science into the ignorant shape of traditional blind faith. Thick. The finger in the wound is not the simplest explanation for how Leonardo constructed this painting to link time and eternity, but the finger pointing to heaven manifestly and simply explains this intent. Perhaps that theme of pointing to a scientific heaven is also why Raphael used Leonardo as his model for Plato. This too proves you are ill informed about Leonardo's life and popular lore that has been in circulation but is not established fact. The red- chalk drawing of a bearded man at Turin is almost always identified as Leonardo da Vinci. It has been described as a portrait "almost too good to be true" of the great master himself. The drawing was discovered in the 1840s, in Italy, well after Leonardo had died. It has not been able to be established with any certainty if this is a likeness of Leonardo. The closest possible likeness of Leonardo closer to his life time are the famous woodcut that heads the chapter on Leonardo in Vasari's "Lives of the Most Eminent Painters"
But those portraits are profiles and limit any direct facial identification. 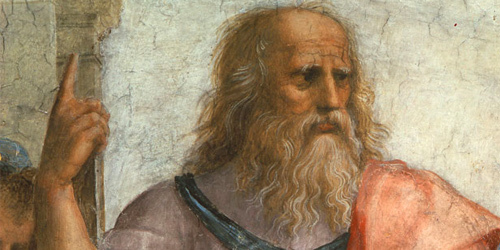 The Athens drawing of Plato that bears a resemblance to the unidentified portrait of Turin is assumed to be Leonardo because the Turin drawing is a portrait that has only been fancied as being that of Leonardo. There is no evidence that it is. "To chose one identification over another is to choose one story as preferable to another. In our hearts we know what we want the answer to be: somehow our idea of Leonardo is diminished if this old man is in fact not Leonardo. But in truth it may not be Leonardo in which case the iconic center of our received image of Leonardo does not hold and we are compelled to tell a different sort of story"
In your heart its him, Robert. But whats in your heart is not evidence enough. Raphael was "thought to have drawn the likeness" of Leonardo but there is no verifiable likeness of Leonardo to establish with any certainty or near certainty, as I have stated above. The author had a college history course about the Italian Renaissance. A bit too obvious I suppose Robert. Well you know some people see all sorts of strange things in art with Christian subject matter. And I suppose one weird theory is as good as the next if we are subjective enough.Here's a mushroom oriented one. www.youtube.com/watch?v=cEmNIz08gis Jesus was a mushroom! You know it makes sense. I cant view the video from my phone for some reason, Flann. Anyway, I suspect what also is in play here is another attempt to distance a genius of the past from the spirit of traditional Christianity, and or traditional religion itself. Other giants of the past are often "recruited" by atheists in an effort to posterize their worldview. You see this happen to men like Voltaire and Newton. Although not traditional men of religion nevertheless they rejected an atheistic worldview. Why not Leonardo as well? Promote him as some type of closet platonist! Also, an honest assessment includes the examination of data that does not support your contention. That obviously is not what Robert is attempting here. Not in the least. And lets not forget I am arguing here like a YEC! Ant, ad hominem attacks of this sort are really unbecoming and reinforce impressions that you are here either for the fly fishing or to catch billygoats on bridges. Play the ball, not the man. I could equally point out that I disagree with some of the views expressed in that article, but my disagreements are not relevant to the substantive point - the motif of the finger pointing to heaven is a symbol of eternal truth. Indeed, the way Raphael depicted Plato as looking like Leonardo strongly reinforces this point about the central theme of the relation between eternity and time as a core issue in Renaissance culture and philosophy, seen in these great paintings. I am glad you raised the point about Thomas and doubt. Doubt is a central theme in the scientific method, of which Leonardo was one of the great pioneering geniuses. My reading here is that Leonardo painted Thomas pointing to the heavens partly to illustrate how The Last Supper invites us to doubt conventional religious beliefs. But then, for people like you who have no need of doubt, I don't expect that reading to butter many parsnips. A further point about how the annual path of the sun links eternity and time is that this path is still basically the same as in Leonardo's day, as a symbol of eternal stability and identity, but it is also constantly changing through the regular patterns of climate and weather. So this symbol of the natural year has the same function as Jesus Christ - who is understood in traditional orthodox Christology as unifying time and eternity. The historical Jesus of Nazareth is conventionally the same person as the Eternal Christ of Glory. Oh, and by the way, here are Leonardo's self portrait and Raphael's depiction of Plato, which that article suggested are similar. Last edited by Robert Tulip on Sun Oct 19, 2014 8:59 pm, edited 2 times in total. If you google "hidden meaning/symbols in The Last Supper" you get hundreds of hits that link you to various kooks that claim to have found something mysterious in Leonardo's famous masterpiece. There are a few hits about hidden astrological signs as well. And of course, everyone by now is familiar with the bogus claims of "The Davince Code"
I think those that advance the notion there are hidden astrological signs in the Last Supper are astrologists who continue to desperately promote astrology as science, when in fact it is no such thing. Anyway, when anyone has the time, google some of the this craziness. The best you can do here is to be agnostic. Unless and until you find corroborating evidence that shines light on the author's intent. This is why interpretation of the bible and other holy texts fails. Interpretation and pattern seeking are useless unless you can show the author intended the results. This includes proving the interpretation vs disproving the interpretation. We're stuck in the middle without corroboration. There is corroborating evidence that shows the authors intent. I've posted some of it here. Youre too busy jumping to the defense of friends and not doing any serious research about this. The people of BT who engage in discussions like these have become so fixated with defending personal beliefs that they are not aware of their childish and idiotic behavior that is unwelcoming to others who wish to share their worldviews. I have presented historical FACTS whenever there has been whig history presented to ridicule religious history. I've also rejected the claims of certain popularized atheists of today. They are not engaging in philosophy of science. I will credit you and give you your due by acknowledging that you and only you AT LEAST recognized instances wherein I presented ideas that refute most of these stupid popularized aesthetic notions that anyone can purchase off a book rack in an airport lobby. Robert is too contaminated by his religious scientism. Everyone else here is just ignorant about a lot of what we talk about. What was popular here before I came aboard was stupid bumper sticker slogans and caricatures of religious people. It was really quite an adolescent group. I'm not impressed by people who are only parroting what they read. That's really not a sign of intelligence or education. Thanks for being so patient with me, Interbane. My post was as much a disagreement with Robert as it was with you. Show me this evidence, from Leonardo DaVinci, where he expressly says his painting does not contain hidden astrological symbolism. I've been reading this thread, and you haven't provided any such evidence. A man can have a thousand intentions with a single piece of art. Listing many of them does not exclude others. A man can have a thousand intentions with a single piece of art. Listing many of them does not exclude others. The above is actually a great insight. And you are right, now that I think about it. Any idiot, while attempting to interpret CERTAIN art, can direct his discovery process in a thousand different directions and arrive at nearly a thousand utterly ridiculous interpretations. A good starting point to avoid a scatter-brained method would be to start with context, both personal and social, then attempt to arrive at the most likely explanation. But someone here is defending the scatter-brained approach for personal reasons. Last edited by ant on Fri Nov 07, 2014 1:32 pm, edited 1 time in total.